Bunion surgery years ago with never any problem until five months ago when I dropped a bottle on first metatarsal,; has hurt ever since. X-rays then and now are negative. MrRi four months ago showed 1) stage 2 HAV with prior corrective osteotomy. Spurs and mild capsulitis at the MTP and IP joint; 2) osteopenia; 3) no findings of stress fracture or osteomyelitis. The pain is day and night, took ibuprofen therapy, house bound in air boot for 8 weeks. The more I walk the more it hurts but will not stop no matter what. Has taken over my life. Have to lie on my back, lying on either side with foot turned laterally makes pain worse. Three doctors so far - no diagnosis. What is wrong and can it be fixed? I do not pretend to be smarter than the three doctors that have actually examined you, (which I have not) but the diagnosis seems pretty straight forward to me. First, lets start out with the history of your bunion surgery. You state until five months ago you had no problem with your big toe joint until you dropped a bottle on it. Without even seeing your x-ray I can tell you that even the best foot surgery, and it sounds like yours was pretty good, does not last forever. Essentially, for the same reasons you initially developed a bunion years ago, your bunion was destined to return over time, to some extent. Bunion surgery corrects a bunion, but does not eliminate the factors that caused it in the first place. So, it can be assumed over time, the bunion will return. That is one of the reasons I tell patients to try and wait as long as possible to have this surgery and this probably holds true for most musculo-skeletal procedures. 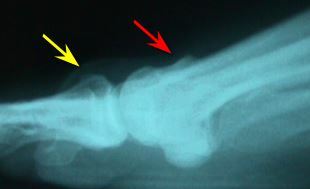 mentions bone spurs (red arrow) and capsulitis (yellow arrow, but difficult to see), and I assume that is referring to the big toe joint as well. So, as I see it, over time, your bunion was slowly re-developing, along with the formation of bone spurs, as they take time to develop. The capsulitis, which is inflammation of the ligament that surrounds the big toe joint may have been present prior to the bottle incident, or may be the result of dropping the bottle on the foot. So, you dropped the bottle on your foot and inflamed the joint five months ago and you are not getting any better. You mention you have been in an air cast for eight weeks; well, after eight weeks, if that has not helped, you will need more aggressive treatment. FYI, the air cast was certainly a good idea, not allowing the toe to move hopefully would have "quieted" down the inflammation. Have you had a cortisone injection into the area? Generally when oral anti-inflammatory medication does not work, an injection should be considered. On that note, have you considered prescription anti-inflammatory medication instead of ibuprofen? Since you basically have what is known as a "traumatic arthritis" you could also consider physical therapy if you have not yet had any. Physical therapy is very good a reducing inflammation. If you try these options (or have already tried them) and they do not work then you may have to entertain more surgery. I am saying this without the benefit of examining you or seeing x-rays, but in most cases the joint has to be cleaned out, meaning the bone spurs have to be removed and the quality of cartilage has to be assessed. If the cartilage is totally worn out, you might be a candidate for an implant.